Is it a Confederate Wraith? Is it a Guzzi? It is a Renard! Well this Confederate looks styling, Guzzi engine styling motorcycle is a new custom made high end motorcycle. Only that the components used in the motorcycle seems to be even more exotic than similar custom maker motorcycle brands. 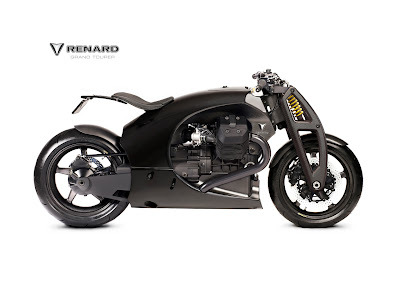 Renard believes a motorcycle should be more than just transportation. Our aim is to combine functionality, quality and stylish looks, and put them at your disposal. Essentially: we want to share our passion for motorcycles with you. This is what you will first see/ read when you visit the Renard website. I am not very sure if you can spot them even in Estonia (that is where they get made, we will come to that later), so for the time being let us just enjoy it on the virtual world. So, under no circumstance can anyone mistake this motorcycle as just a mode of transportation. But Mr. Andres, you aim to combine functionality, quality and stylish looks was achieved rather pretty easily. One must say you have accumulated a team of very talented people. 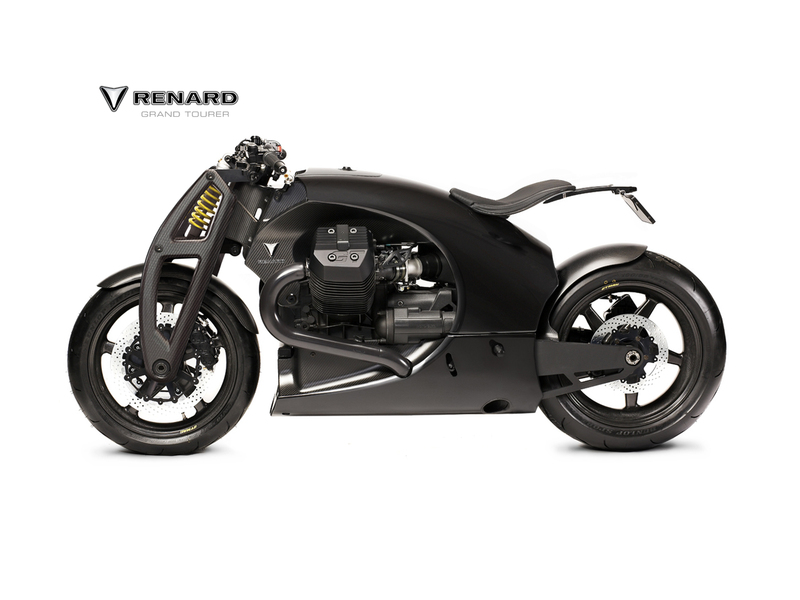 To start off, let us bow to the Renard Motorcycles development team of Andres Uibomäe, Kaarel Kivikangur, Kaido Karjus, Mait Mahlapuu, Karl-Eerik Unt and Siim West. What a product! This particular model is promoted as a GT (Grand Tourer) model. Without pictures of a rider on it, I am not too sure about that since the Confederate doesn’t kind of give you the best image of a GT, nonetheless, it just might be if Renard is promoting it in a particular way, the Renard Grand Tourer 2010. 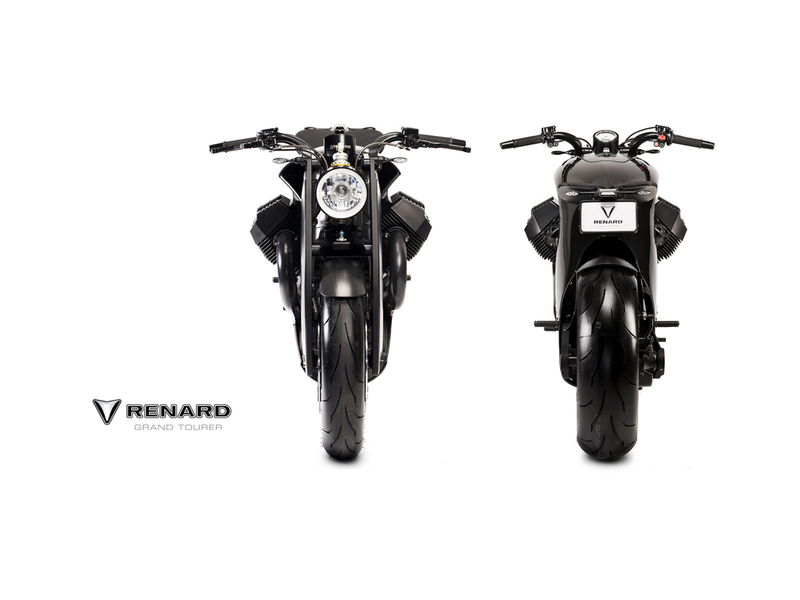 It gives the impression and is actually a power cruiser, but Renard refers to it as a sports power cruiser, ‘a symbol of individuality and power, with best-in-class handling and built in quality’. As much as I try to ignore, I just cannot deviate my thoughts as how strikingly similar this GT model is to the Wraith. I guess at first strike, most of us will feel the same way. Then after noticing the engine, I thought this must be a custom made Guzzi. Well, part of that is true. All of these thoughts slowly stared going away and you will really start to really appreciate the bike once you look at the components and materials used in the bike. 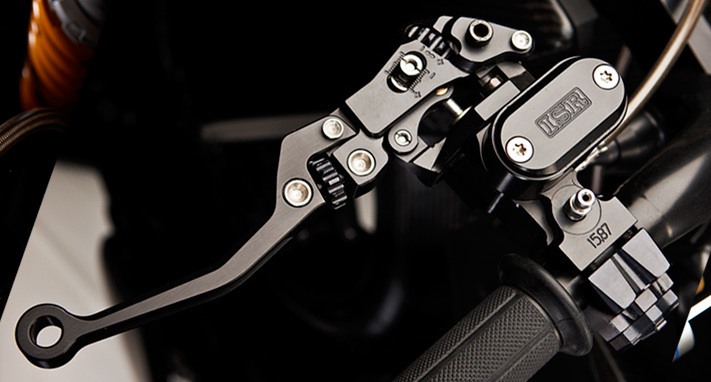 Take a look at the small images below showing the clutch holster, tail light and other things. I am telling you it really has an exotic feel. Okay, we can come back to appreciating the beauty later, let’s see what goes inside the motor. 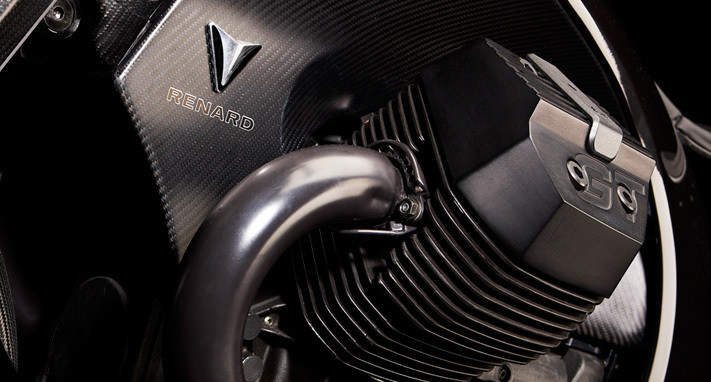 ‘The DNA of the Renard Grand Tourer is engineering intelligence – an ultra-light composite unibody, longitudinally mounted V2 engine and components that represent the cutting edge of the motorcycle industry.’ As I tried to find out what kind of engineering intelligence has gone inside it, I found that the GT monocoque is made in carbon fiber and reinforced with Kevlar. 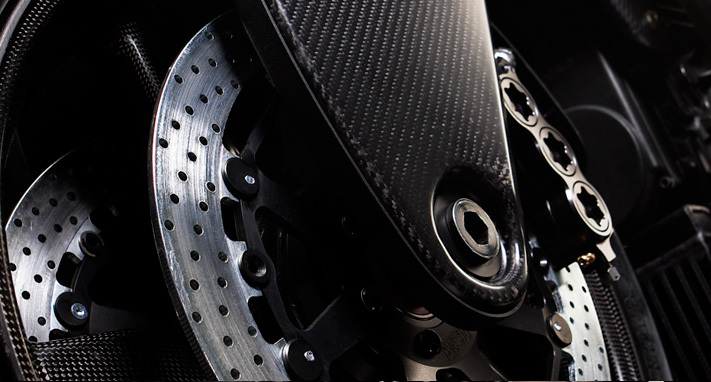 For those few uninformed, monocoque differs from a frame or chassis as in a monocoque the external skin is utilized to support bulk of the weight unlike an internal frame or chassis that needs further cosmetic finish. 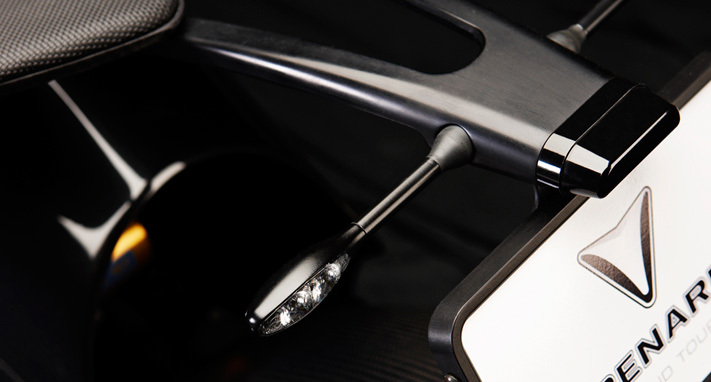 This way not only is the bike lighter, but is gets cheaper and much tougher. 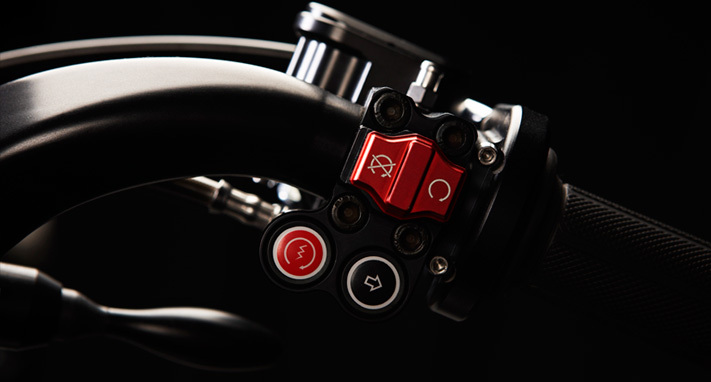 It is a win-win situation and this is where the next stage of motorcycling is heading to. And now what is Kevlar? Kevlar is a material that is formed by weaving, like a spider web and so it is extremely tough, but very light. It is so diverse in its use that is can be and is used for bullet proof vests to bicycle frames to tyres and also to get protection from even tornados! yes it is that diverse. Nonetheless it is a premium product. It doesn’t rust, difficult to corrode and almost insensitive to heat. FYI, it was created by Stephanie Kwolek and Herbert Blades. Point I am trying to make is that as mentioned, Renard has used high quality materials for this niche product. The monocoque weighs only 11 kilograms integrating the motorcycle’s frame, petrol tank and air box into a single load-bearing structure. The GT’s grid suspension is adjustable in two directions, and… okay, okay, it does remind of the Wraith every time but just think imitation is the best form of flattery. But again it is just not the girder fork, event the seat and frame beneath it reminds me of the Wraith. Anyway... the girder fork is adjustable for rake and trail as well as the preload and rebound damping. 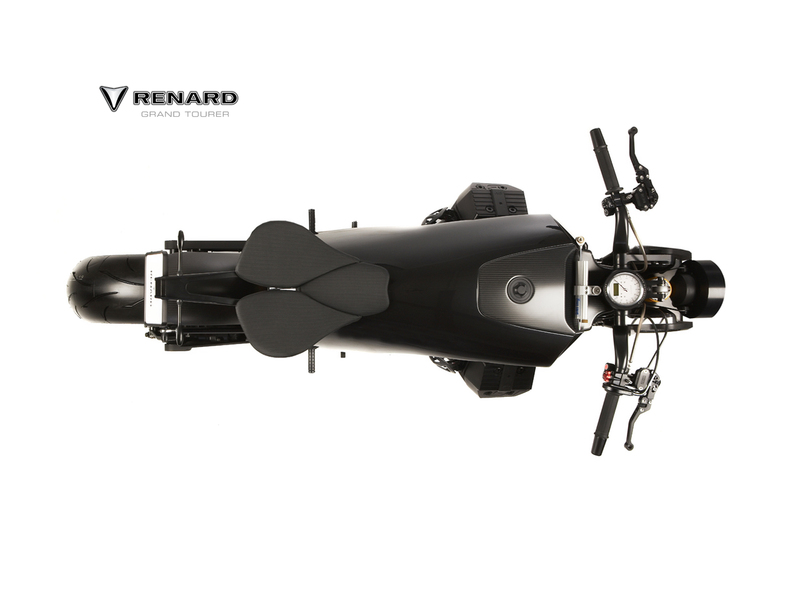 Renard has used hardened-aluminum (aircraft aluminum) components that will give the machine unmatched quality and reliability. The bike weighs just 190 kilograms. Okay, now getting back to what’s inside the heart. 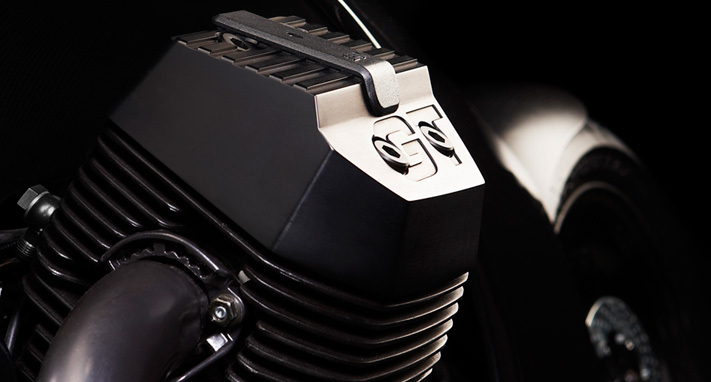 That engine is unmistakably a Guzzi and yes, it is a Guzzi. I guess that is where the tourer part comes in. The engine is a air cooled V-Twin displacing 1151cc through its eight-valve belting out 125 hp of power @ 8000 rpm and and 120 Nm of torque @ 6000 rpm which will give you an idea that with that much weight, this bike will be pretty fast. And so it is a Sports Grand Tourer! As per the claims in the website, the bike has the potential of doing 230kmph. I won’t be surprised but that does seem to be an optimistic figure. Nonetheless, the Guzzi engine is a potent one, has got good torque at low revs and of course as a traditional Guzzi, you can expect a silky smooth acceleration. 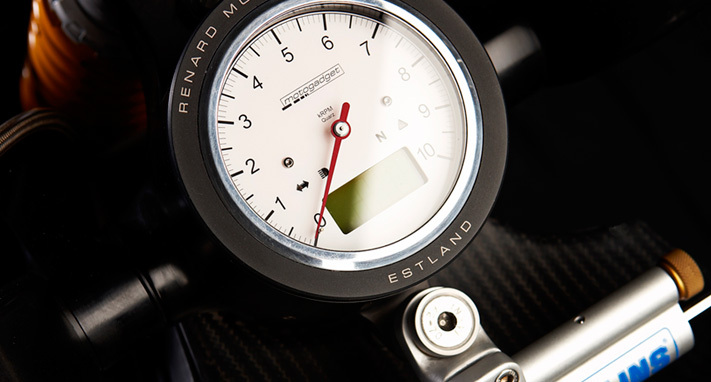 A little history on Renard says that Renard started out as a motorized bicycle company in 1938 in Estonia founded by one Mr. J. Laan. 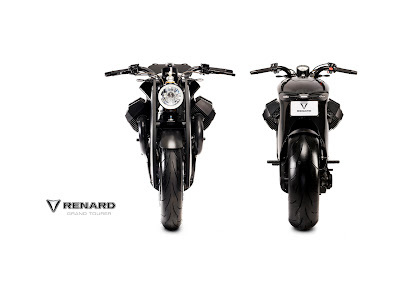 In French, renard means ‘Fox’ and likewise in the motorized bicycles, there was the logo of renard with a fox head. 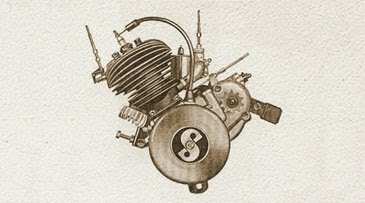 The company started out with a 98cc Sachs engine. During WWII, the Renard factory was destroyed and after the war, the company just ceased to make any impact. It is believed that there are no complete pre-war Renard motorized bicycle existing today, but someone has caught hold of a frame somewhere in this world as mentioned in some forum. 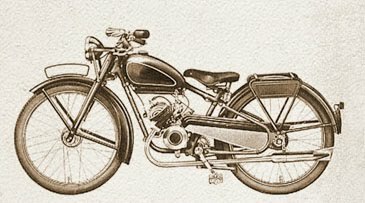 After more than half a century, a group of entrepreneurs from Estonia wanted to make Estonia’s first motorcycle of the new century. 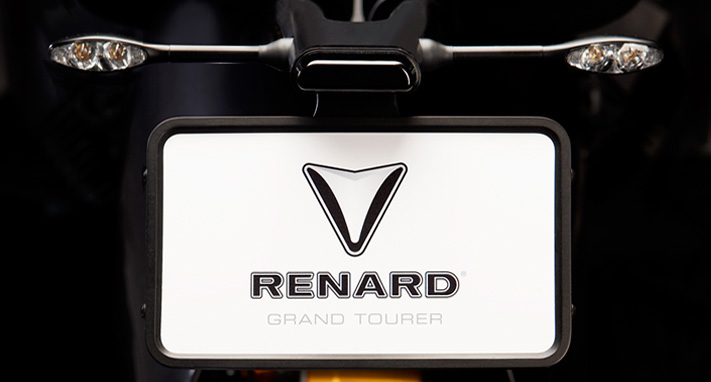 Joining hands with bike racing engineers and bike designers, they thought what better way than to give the name Renard, a true Estonian symbol. Two years in the making and this year in April, the “prototype” was displayed at the Hanover Technology Fair. The motorcycle will go for production next year, so it is very much round the corner. 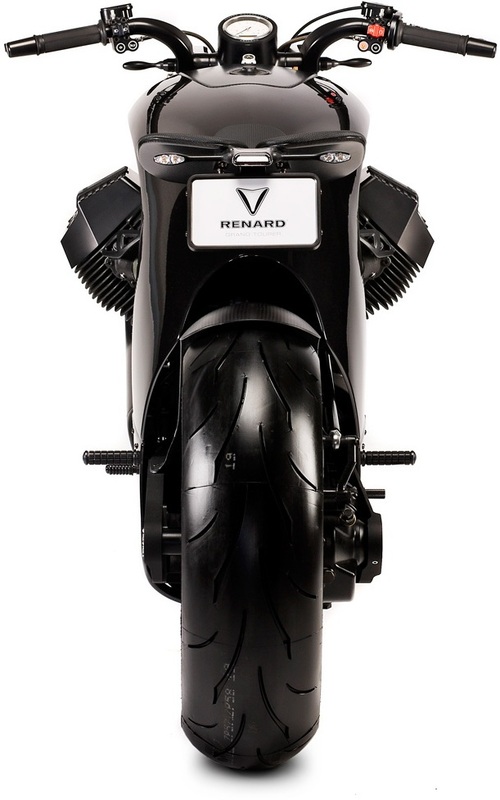 There will be just 100 Renard GT each year and with the things going inside, this bike will be expensive, no two things about that. The finishing is simply outstanding, the materials as reminded time and again are all high class. Again, do check the small pictures on full scale and you will be impressed. According to Andres, “This is a surgeon’s blade on two wheels, providing you with a complete and powerful riding experience.” No one is going to argue with that. One thing we will all be waiting for is its first test ride, nonetheless, one can expect a bike to perform very strongly yet smoothly with precise handling. Front & Rear brakes: Twin semifloating discs, 320 mm with 12.6" six piston monoblock calipers & Single semifloating disc, 220 mm; 8.7" four piston monoblock caliper. Front & Rear wheels: Carbon fiber 3.50 x 17" & 5.50 x 17"
Dimensions: Lenght: 2100 mm; 83"/ Width: 840mm; 33"/ Height: 990 mm; 39"
Seat height & Minimum ground clearance: 850 mm; 33" & 140 mm; 5.5"